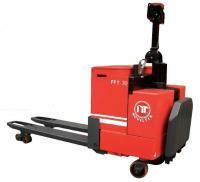 Powered Pallet Truck (1.8 Tons/2 Tons/3 Tons/4 Tons)(PPT-18/20/30/40) - Noveltek Industrial Manufacturing Inc. It can save a lot of man power, and increase productivity. 2 pcs of hydraulic lifting cylinders are built in right and left sides, it lifts very stable and much better than the single cylinder pallet truck. 2 pcs of the strong castor wheels are fixed at right and left sides. This truck does not have any balance problems when turn a cycle. 3 pcs of adjustable springs controlled suspension drive motor. The drive motor can be moved up and down by 45mm. Battery is not lifted up/down with forks, it can save a lot of electricity. Reverse safety control switch protects driver. The ride-on platform has gas shock absorber in-side to fold. Chargers have 220V/40A, 220V/30A, 110V/40A, 110V/30A for select.